LIVE THE ULTIMATE GUITAR EXPERIENCE! Manuel Valencia is the most exciting young talent in the world of the Flamenco guitar today. He follows the success of his quartet’s UK debut at Kings Place in October 2016 with a return as a soloist. He will be playing music from his new album ENTRE mis MANOS which has already met with great international acclaim. 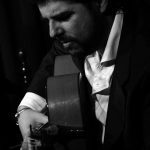 Manuel’s playing shows great musicality and a quite astonishing technical ability which has to be witnessed to be believed! Manuel Valencia grew up with a guitar under his arm. 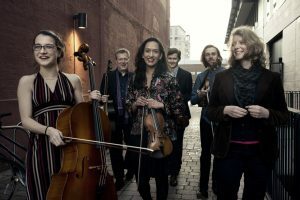 He studied with his uncle, Fernando Terremoto, before being recruited by Gerardo Núñez to join his ensemble, with whom he has toured internationally. His sensational soloist debut at the 2010 Festival of Jerez paved the way for appearances at a host of prestigious festivals such as the Seville Biennial, the Festival de la Mistela, Mont de Marsan and Suma Flamenca soon making him one of the most sought after Flamenco players in the world. In 2014 he won the ‘Revelation Giraldillo’ of the Bienal de Sevilla “for his original contributions to traditional toque”. Double Album Launch: a remarkable event in the guitar calendar! This concert launches two major guitar albums: cançons i danses by the Eden Stell Guitar Duo featuring the first guitar CD entirely devoted to the music of the Catalan composer Federico Mompou and Ignite by Tom Kerstens’G Plus ensemble which offers an all new music programme including work by Max Richter, Gabriel Jackson and John Metcalfe. Both groups will play one half of the concert, approximately 50 min each. The Eden Stell Guitar Duo are recognised as one of the very best guitar ensembles in the world. 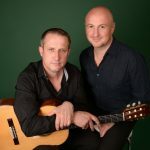 Having celebrated their 25th anniversary last year Mark Eden and Chris Stell embark on yet another groundbreaking project: the first guitar CD of the wonderful, magical and improvisatory music of Federico Mompou (1893-1987). Born in Barcelona Mompou was another major figure in the great line of composers/pianists which also includes Isaac Albéniz and Enrique Granados. The sublety, intimacy and colourfulness of his cançons i danses (songs and dances) in Mark Eden’s brilliant arrangements work very well on the guitar. Tom Kerstens’ G Plus Ensemble features the brilliant young musicians of the Ligeti Quartet as well as the outstanding percussionist Karen Hutt. Their new album ‘Ignite’ follows the major success of G Plus’ first album ‘Utopia’ which was recorded for Peter Gabriel’s Real World Label. Tom Kerstens is one of the world’s leading performers and advocates of new guitar music, having commissioned over 85 new works, many from minimal or post minimal composers like Graham Fitkin, Terry Riley and Kevin Volans. Hailed as one of the five best guitarists world wide and a ‘refreshing musical explorer’ (Classic FM) he continuously seeks to widen the guitar’s horizons. His G Plus Ensemble is dedicated to new music, its line-up of two guitars, strings and percussion, often using electronic effects, produces a ravishing and innovative sound. The new album presents new work by some of today’s most prestigious contemporary composers such as Max Richter, Gabriel Jackson, Howard Skempton and John Metcalfe. with Archibald Ligonniere, drums and Romain Labaye, bass. 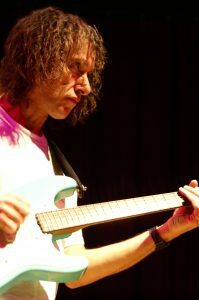 Scott Henderson is a giant in the world of jazz rock guitar. He played and recorded with Chick Corea’s Elektric Band, with violinist Jean-Luc Ponty, bassist Jeff Berlin and ‘Players’, and a four year stint with Weather Report’s Joe Zawinul. Henderson formed the band Tribal Tech in 1984 with bassist Gary Willis, and after nine critically acclaimed albums, Henderson has proven himself as a world class player and composer. In 1991, he was named by Guitar World as the No1 Jazz Guitarist, and in January 1992, he was named No1 Jazz Guitarist in Guitar Player’s Annual Reader’s Poll. Scott is also a world class blues player and his first solo album “Dog Party“, a welcome retreat to his musical roots, won best blues album of 1994 in Guitar Player. Since then he has released more highly acclaimed jazz/rock and blues albums and won nummerous awards.